Google+ is a great place online for your pictures. It is the rebranded name for Picasa Web Albums. I’ve been uploading my pictures to Picasa Web Albums (PWA) for many years. That’s how I share my pictures. Once I allowed my Google account to migrate to Google+, those same pictures are viewable in Google Plus photos. It’s the same set of pictures, just a different interface. Google+ is also an app for iPhones, iPads and Android devices. This makes it easy to view all your uploaded photos on your mobile device. There is also a setting that will automatically upload the pictures you take on your phone or tablet to your web albums. If you use that, then you’ll be able to delete photos from your phone. I know several people who have run out of space for photos on their phone because they never delete any! You don’t actually need to use Picasa for this to work however. It is a separate piece of software, it just gets delivered with Picasa. If you don’t want Picasa, you can separately download Auto Update for Mac or Windows Desktop. You will see Google+ Auto Backup in your list of Apps, or All Programs, of your computer. All on its own, it will upload all pictures from your computer. 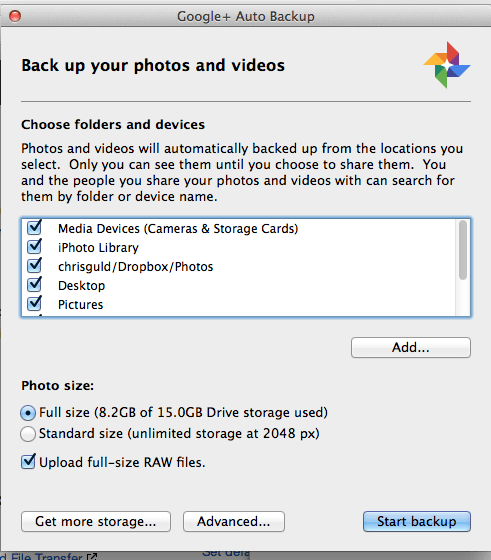 Those uploaded photos will be in your Google+ Photos account in a private album called Auto Backup. Change the default options to match your needs. When the Auto Backup software is first installed, it has settings that I think need to be changed. Choose Folders and Devices: Notice that everything is checked. In my case, I only wanted My Pictures checked. Photo Size: Notice that the default is Full Size. That will take forever and quickly use up your allotted space from Google. Changing this setting to Standard size (2048 pixels) gives you unlimited storage space. If you’re a professional photographer, this will probably not be acceptable. Then you will need to pay for storage. Be aware this will use your Internet connection. If your data service is on a metered connection, this could cost you big time. If you’re uploading 1,000 pictures and they’re 500K each (about right for 2048 pixels) then that is using 1/2 Gigabyte of your data service. If you have a 2GB/month plan, you’ve just used up 25% of your monthly allotment! Make that 10,000 pictures and you’ve now used 5GB! If you’re in a house with unlimited cable-provided Internet this is not a problem, but if you’re traveling and depending on Verizon or AT&T etc. for your Internet connection, you’re probably paying about $10/Gigabyte. You’ll Never Lose a Picture Again! At a recent appearance where we taught Picasa, we worked individually with a woman who had recently lost a month’s worth of irreplaceable pictures from a once in a lifetime trip. As I was showing her the Google+ interface for pictures on her iPad, she shouted with joy because she saw the pictures she thought were lost. Apparently, she had the auto-backup feature on and didn’t even know it. That is the true benefit of Google+ Auto Backup. Another benefit of using the Auto Backup feature is that you will see all possible Auto Awesome pictures that Google+ can make from your photos. A few days ago, we visited Animal Kingdom at Disney World. I had my camera on action mode and snapped several pictures every time we saw an animal. I imported my pictures to the computer and just picked a few individual shots to upload and share. I later looked at the Auto Backup album on my Google+ account and I saw that a few of the animal series and been turned into animated .gif pictures. How cool! Should You Use Google+ Auto Backup? I hope I’ve given you enough information here to make that decision yourself, because this feature is not for everyone. IF you have unlimited bandwidth on your Internet connection and IF you’re OK with changing the size of uploaded pictures to 2048 – then my answer is “Why Not?” However, IF you have 20,000 pictures in your My Pictures folder on your computer, then realize it’s going to take a week or so to upload them all. That was my situation. And, I already had all those 20,000 backed up to external disks and stored offsite, so I did not turn on Auto Backup at first. Then I got a new computer, and started a fresh Pictures folder, I decided to turn on Auto Backup. I’m really liking it. My previous 20,000 pictures are stored on an external hard drive connected to my new computer so I still see them all using Picasa, but I can direct Auto Backup to only work with the C:Pictures folder. I used to make a backup to DVD of each month’s pictures. Then, at the end of the year, I would also make another backup of the year. Now that Google+ is making an online copy of all my pictures, I think I’m safe just doing my annual backup to DVD. I also feel more inclined to delete bad pictures from my computer knowing that, if I changed my mind, they are available online. Published by MrsGeek, in Blog. Tagged with Auto Awesome, google, Lost photos, Picasa.